Stay connected no matter where you are! • Stay up to date with thelatest announcements and organizational news for your chosenlocation.• Easily view schedules for each day and filter for thetypes of classes that you like.• Subscribe to push notificationsand stay informed with notifications sent straight to your lockscreen.• No more worrying about keeping up with your barcode oryour kids’ barcodes, store them in the app for easy check-in. Search exercise schedules, get new programinformation, see facility closings and more!The app contains exercise schedules, aquatics schedules,programs & events information, and facility status.EXERCISE SCHEDULES* Have a class in mind? Search class times based on your classname. Find a list of classes, instructors, descriptions, andlocations. * Daily class schedules.AQUATICS SCHEDULES* Search water aerobics schedules based on class name, dates andmore.PROGRAMS & EVENTS* See upcoming YMCA programs such as sports registrations, newclasses, new videos and more. * Share this info via email with your friends and family.FACILITY STATUS* Need to know if a sports practice or game is canceled? TheFacility Status service gives you up to the minute statusinfo. * Pool closed? We can tell you. * Get Push Notifications of practice and game cancellations. Ozarks Regional YMCA Mobile ApplicationSearch exercise schedules, get new program information, seesports field closings and more!The app contains exercise schedules, aquatics schedules,programs & events information, and sports field status.OZARKS REGIONAL YMCA - EXERCISE SCHEDULES* Have a class in mind? Search class times based on your classname. * Find a list of classes, instructors, descriptions, andlocations. * Daily class schedules.OZARKS REGIONAL YMCA - AQUATICS SCHEDULES* Search water aerobics schedules based on class name, dates andmore.OZARKS REGIONAL YMCA - PROGRAMS & EVENTS* See upcoming YMCA programs such as sports registrations, newclasses, new videos and more. * Share this info via email with your friends and family.OZARKS REGIONAL YMCA - FACILITY STATUS* Need to know if a sports practice or game is canceled? * The Field Status service gives you up to the minute statusinfo. * Pool closed? Snow closures? We can tell you. * Get Push Notifications of practice and game cancellations. Central Bucks Family YMCA, Where EveryoneFeels Welcome!A YMCA located in Doylestown, PA.Search exercise schedules, get new program information, seesports field closings and more!The Central Bucks Family YMCA app contains exercise schedules,aquatics schedules, programs & events information, and sportsfield status.Central Bucks Family YMCA - EXERCISE SCHEDULES* Have a class in mind? Search class times based on your classname. Find a list of classes, instructors, descriptions, andlocations. * Daily class schedules.Central Bucks Family YMCA - AQUATICS SCHEDULES* Search water aerobics schedules based on class name, dates andmore.Central Bucks Family YMCA - PROGRAMS & EVENTS* See upcoming YMCA programs such as sports registrations, newclasses, new videos and more. * Share this info via email with your friends and family.Central Bucks Family YMCA - FACILITY STATUS* Need to know if a sports practice or game is canceled? The FieldStatus service gives you up to the minute status info. * Pool closed? Snow closures? We can tell you. 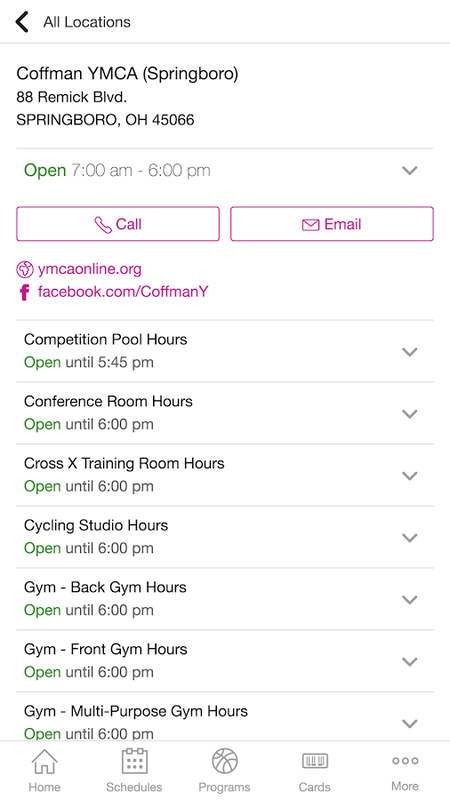 * Get Push Notifications of practice and game cancellations.Central Bucks Family YMCA...where our focus is to strengthencommunities and we are committed to nurturing the potential inkids, promoting healthy living, and fostering a sense of socialresponsibility in all that we do. Countdown Time tracks upcoming events in beauty and elegance. Haveyour most anticipated events right at your fingertips withCountdown Time. Events are tracked to the second in real-time withrazor accuracy. Feel the excitement as the day draws closer andshare it with friends and family. Pick from hundreds of beautifulbackgrounds to truly bring your event to life and make the dayuniquely yours. Features ✔ Track as many events as you want ✔ Fullycustomizable widget ✔ Beautiful, sleek and elegant design ✔Multiple themes ✔ Pick from hundreds of HD backgrounds or use yourown ✔ Daily countdown notifications ✔ Personalize your event withdisplay modes and headings ✔ Built-in event sharing Start thecountdown! Events are what make life shine. They are the moments wewill forever be looking back on; and the moments we can't wait for.Whether it's your sister's wedding, your son's graduation or yourown birthday, you know that it will be a day to remember. Use itfor a holiday trip, vacation travel abroad or an anniversary thatyou can't forget. Keep track of big days like Christmas or NewYears eve. Daily notifications will keep you up to date with yourevents and milestones while the widget gives you an instant glanceat your date. Forgo a clunky calendar for a sleek and beautifulcountdown timer: It's your big day and you need it to be asmagnificent as it can. A simple calendar won't do it justice. Thecount down starts today - set your clock. More than just Christmas,weddings and birthdays Use Countdown Time for tracking any event.Any event at all! Set up a countdown app to a big presentation,track the seconds until a family dinner, set the widget to countdown to your birthday or measure the amount of breaths until aromantic date. No day is too big or too small to be tracked in theapp. It's completely up to you and what you want your milestones tobe. Set your date and let Countdown Time and its widget take careof your vacation, holiday or wedding day. Your day, your way It'syour event and you get to choose how you want the clock to countdown to it. Choose the full-on experience by opening the app or anat-a-glance look with the resizeable widget. Count down in days,heartbeats, years and more - just pick the display mode that fitsyour big day. The app comes with breathtaking backgrounds that gowith any occasion: from wedding days and to travel. Your clock iswhat you want it to be and your date is when you want it to be.Choose from 15 app themes to personalize your count down clock.Build the excitement. Share the moment. Your excited about the bigday - that's why they are called big days after all! You go to bedevery night with dreams of your vacation in Paris or your weddingdate. Or both - perhaps your wedding is in Paris while you're onvacation! Up the anticipation by adding a daily reminder of thesebig days to your life. Count down the days to your next big holidayand share it with your friends and family. The built-in sharinglets you instantly share a beautiful snapshot of your clock withfriends and family. Use the gentle daily notifications as areminder to get Christmas presents. Show your loved ones how manydays until your birthday to hint for that "surprise" birthdayparty. Count the days until your graduation and freedom. GetCountdown Time now to bring excitement and anticipation to your bigevents! Stylish and lightweight app to remember and track your events in asimple and fast! View the remaining days or days elapsed after anevent. You can use it to remind you: appointments, anniversaries,birthdays, holidays, exams, events festivals ... customize withyour own photos or use the search feature that finds thousands offree images on Pixabay! You can also create an alarm for eachindividual event. You can choose a favorite event to be displayedevery time you open the app! Features: - Choose the event image,from: camera, gallery or search online on Pixabay; - Choose yourapp background color! - Creates a notification for each event; -You can choose a favorite event for display at startup; - Daysremaining before an event; - Days elapsed after an event; - Doubleclick on the countdown to change the color; - Drag the countdownwherever you want; - List of all events; - Unlimited number ofevents! - Share an event on social networks or with your favoriteapplications, save, print, copy, use as background Wallpaper! Forinformation or suggestions, please use the support form in theAbout menu of the application. Everything you need for your American Marketing Association eventexperience is right here. The AMA Event App gives you access towhat’s happening as well as opportunities to customize yourschedule and connect with peers. Reminder app and widget that reminds you about important events andtasks. Never miss a birthday, wedding,tasks or event with thisbeautiful date countdown widget. No longer need to manuallycalculating days left until some date. Сountdown timer is reminderwith alarm. Сustomize your Сountdown timer widget and app as youwish: - Many Themes - Customize colors - Different widgetbackgrounds - Add reminder Did you ever forget an date? Сountdowntimer widget will help you countdown to date. Сreate to-do list andget excellent task reminder. Did you ever forget your girlfriendsbirthday? You never miss this day again, because you have aRemindMe widget. Counting down to a celebration, your wedding, abirth in your family, new year, christmas - reminder widget can it- add reminder.